"Lori Loughlin" and "Michael Avenatti" visit some prisoners in the "Saturday Night Live" cold open. “Saturday Night Live” returned with its weekly skewering of the rich and famous Saturday night. After another weird week in the world of celebrities, this time it went straight for prison. 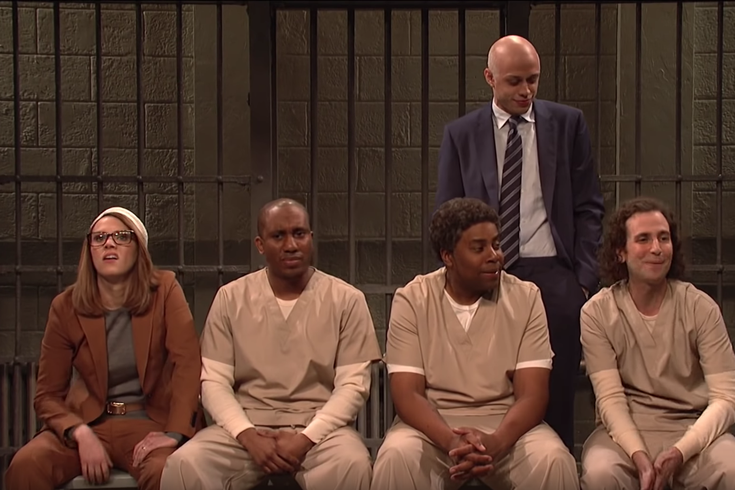 With names like Lori Loughlin, Michael Avennati, and now Julian Assange all being arrested for wildly different reasons, SNL took things one step further: what if all these high-profile arrestees landed in the same jail cell? This, they decided, would be the result: a bunch of weird celebrities trying to one-up each other. Of course, the conceit isn’t all that far-fetched: we learned this week that weird celebrities actually do sometimes pal around in prison. Michael “The Situation” Sorrentino, former star of MTV’s “Jersey Shore”, is apparently hanging out with Billy McFarland, the scam artist behind the failed Fare Festival music festival, in prison. We don’t know what these celebs’ prison lives will actually be like, but we do know they won’t include Loughlin running back her role in “Fuller House” on Netflix.